I have heard from some parents that the less toys they have in the tub the better they like it, because they just want baths to be quick. 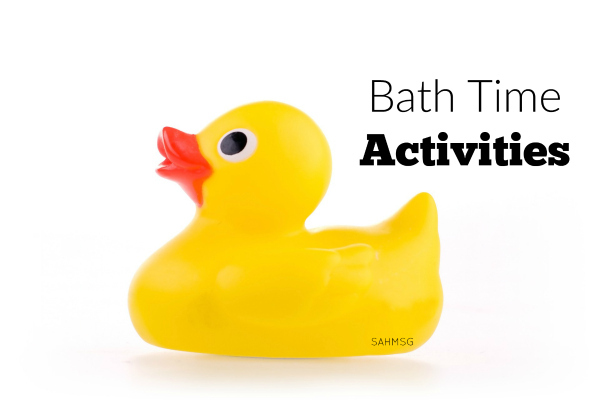 I think giving kids some fun bath time activities can make bath time time that I get to sit for a bit. Bath time can be a relaxing time for all of us. The kids just need some helpful activities to keep them playing in a positive way. 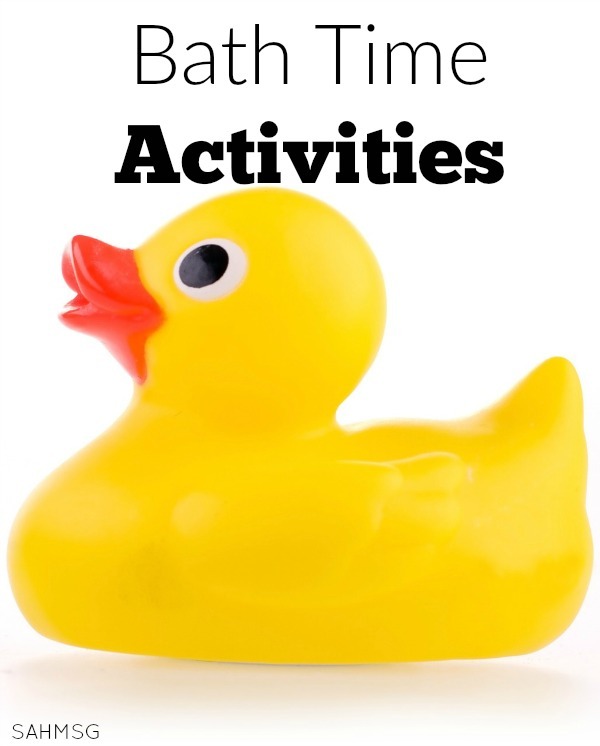 Here are a few bath time activities that I have given the kids to add some new life into bath time. The kids stay interested, and we parents do not have to be bored. Create a spinner with a paper plate and a metal fastener. -Cut out an arrow from paper. -Punch a hole in the plate and the arrow. -Fasten them together with the fastener like the picture. -Spin the arrow, and where it stops, your child can wash the part pictured. 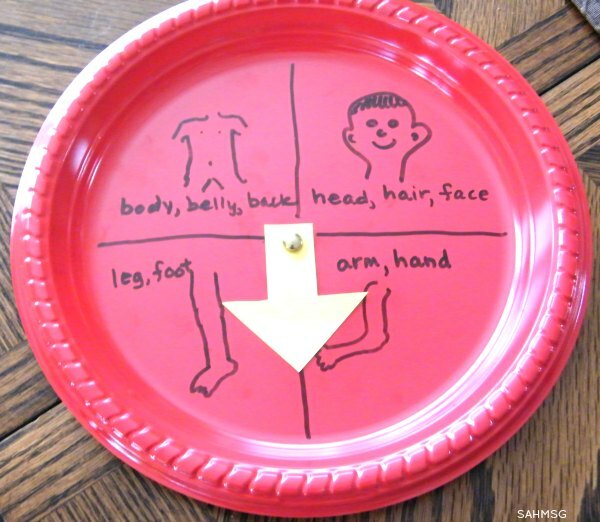 This is a fun game for learning body part names too. As I was using the spinner last night, I thought index cards would work a little easier. -Write ‘arm’, ‘leg’, ‘head,’ ‘neck,’ etc. on index cards. -Place the cards in an empty wipes box, empty kleenex box, or a zip top bag. -When your child is in the bath, pick out a card and have them wash that part. Make sure you include enough cards to get all parts (i.e.2 arm cards, 2 leg cards), so you don’t have to remember which parts have not been washed. There are items in your kitchen that can help with development and increase fun in the bath. -A whisk, bowl and soap pump help develop wrist and hand strength: Place a pump of soap/bubble bath in the bowl, add a bit of bath water, and your child can whisk to make bubbles. Whisk the whole bath to stir it all up for more adventure. -Add a turkey baster too: great for strengthening the control of the hands and fingers. -Even medicine droppers or medicine syringes (no needle) can be used to really challenge the hand strength of the older preschooler. -An empty soap pump can be filled with bath water and pumped to squirt the water around. A friend of mine shared this idea a few years ago. -Hang a clear shower curtain liner on the rod, and tuck the bottom of it inside the bath tub. -Let your child splash away! The water will not spray out of the tub, and your child will burn energy at bath time. -They can use bath crayons, bath paint (see below) or just paint brushes and bath water, to ‘color’ on the inside of the curtain as well. Add a bar of soap into the bath. (I love the natural bars of soap from Young Living!) A bar of soap is a challenge to hold onto for small, wet hands, so it can be a game to grab it. -Pretend it is a slippery fish, and catch it. -Try squeezing it through your hand to make it ‘swim’ from one end of the tub to the other-see how far it goes! Wash them up and place them in the tub. Buckets, watering cans, sifters, etc. can all be fun in the bath. Don’t add them all at once. Change things up every week or so by adding a few new items and taking out a few old ones. Mix food coloring with shaving cream and you instantly have a washable bath paint that does not stain your child’s skin. (Don’t use the whole bottle of food coloring! 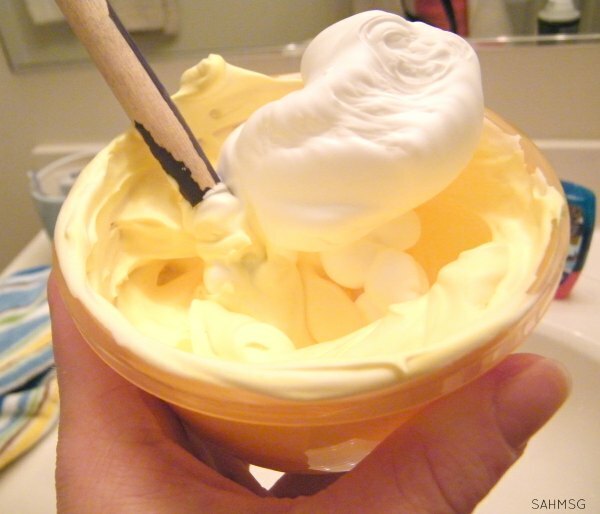 Just 3-4 drops per cup of shaving cream. This is fun to paint on the tub area. My children loved painting their arms or legs. Grab an empty foam egg cartons as a palette for the shave cream paint. Place a different color in each cup. An ice cube tray would be great as well! 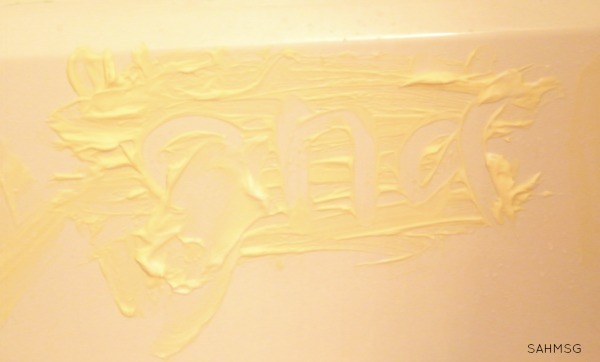 For older kids, paint a layer of the “paint” on the wall, and then use a finger to write words in the shave cream paint. This is a fun alternative to working on the spelling words! 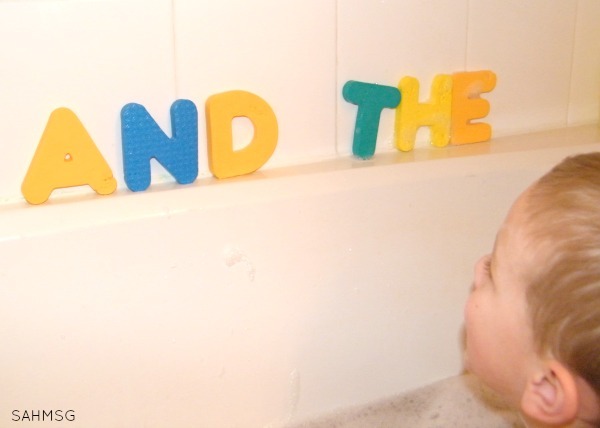 Use foam letters to spell words on the wall of the bath area. The foam letters you can get at the Dollar Store stick to plastic when wet. Toss them in the tub for play and then stick them to the wall to spell your child’s name or familiar words. Buying two sets of letters helps with the variety of words you can spell. On a side note, I recommend cleaning the bath squirter-type toys regularly with a natural all-purpose cleaner. Water tends to not drain completely from inside and mold will grow. Yuck! Squeeze the toy in the cleaning solution so it fills up. Let it float in the remaining water for 20 minutes or so. After that time, squeeze the water out of the toy, rinse it with plain water a couple of times to eliminate any residue, and it’s ready for the next bathtime! Did you know we have activity pages for each age group? Check them out!